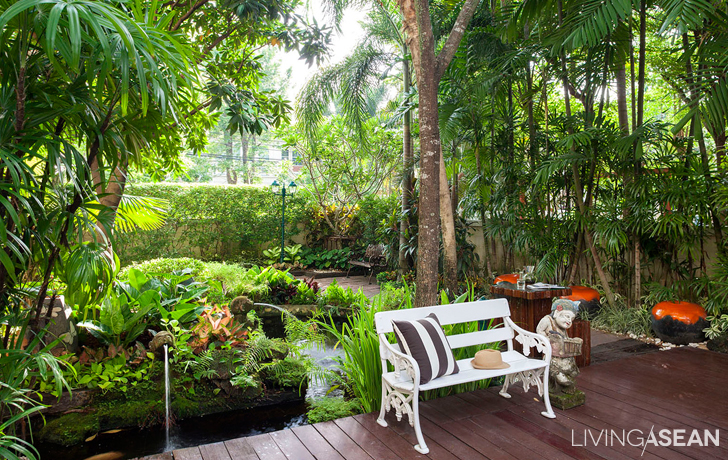 For an escape from the chaos of the concrete jungle, nothing compares to this garden with an authentic tropical look. 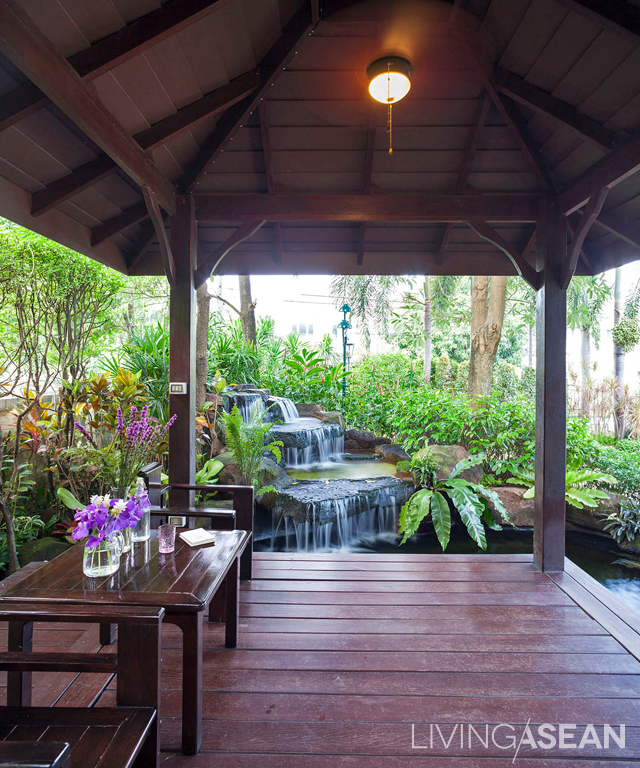 The salubrious backyard has got them all – the rainforest canopy, bird sounds, and the mellifluous music of rustling leaves and waterfalls. 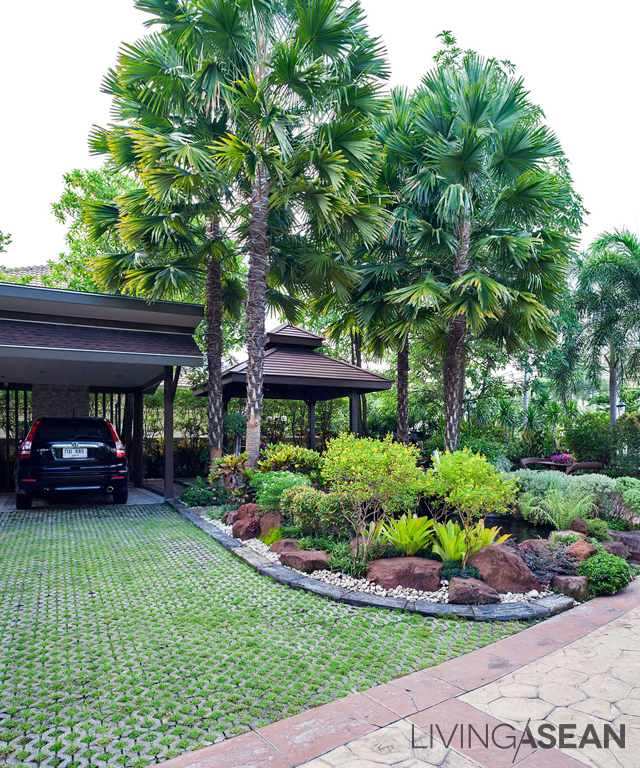 Story: Isara Sonsart /// Photos: Sitthisak Namkahm /// Garden Decorator: Suansuay Landscape Co., Ltd. 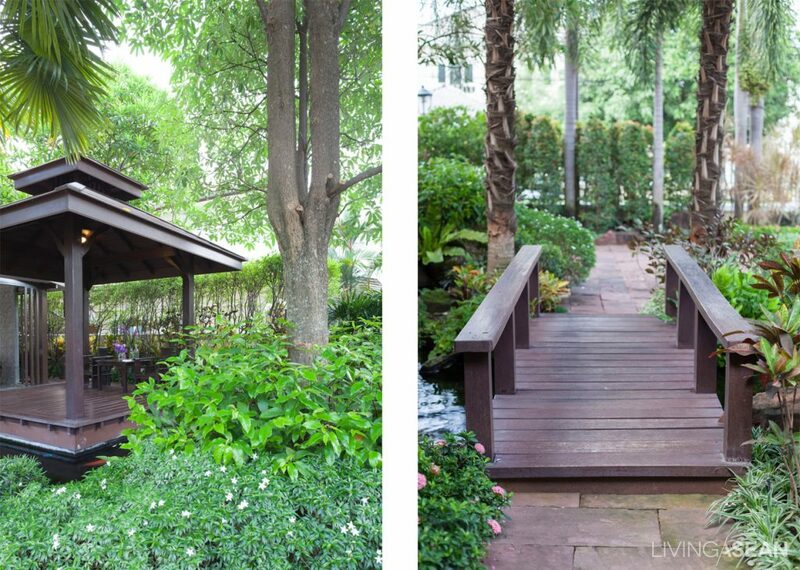 Even as he lives in the city, the owner of this house considers himself a nature lover. Without hesitation, he sets aside more than half of his property for forest gardening incorporating trees, shrubs, perennial vegetation and water features. 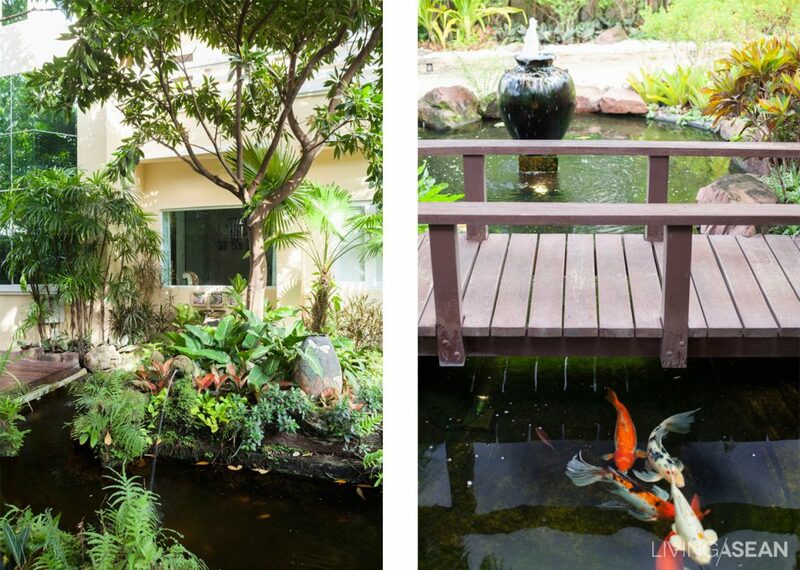 When he told the garden designer what he wanted, the designer not only set up a Tropical garden, but also made the house an inextricable part of the lush oasis. Beautiful black palms were planted to shade the house against the sun. Australian rose apples were put in along the perimeter wall to camouflage the house from the outside. 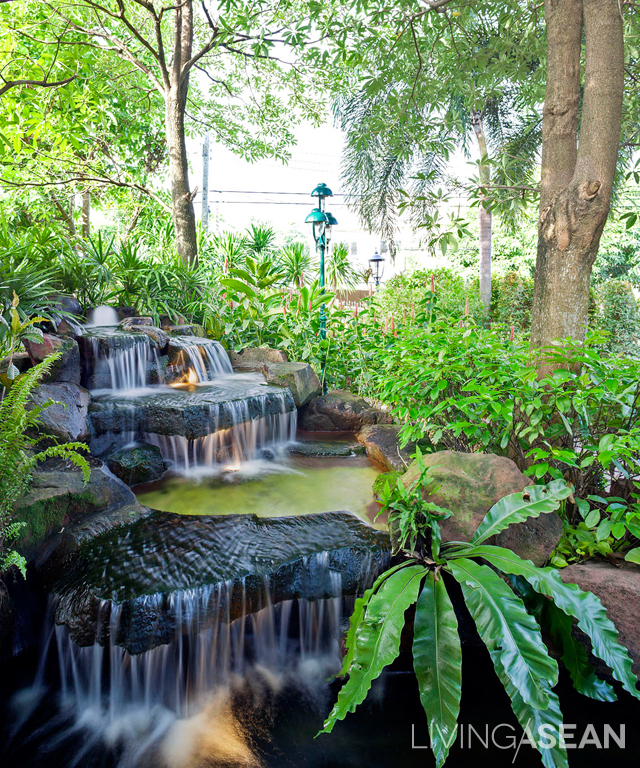 And a backyard waterfall was built near a sundeck designed for family activities. 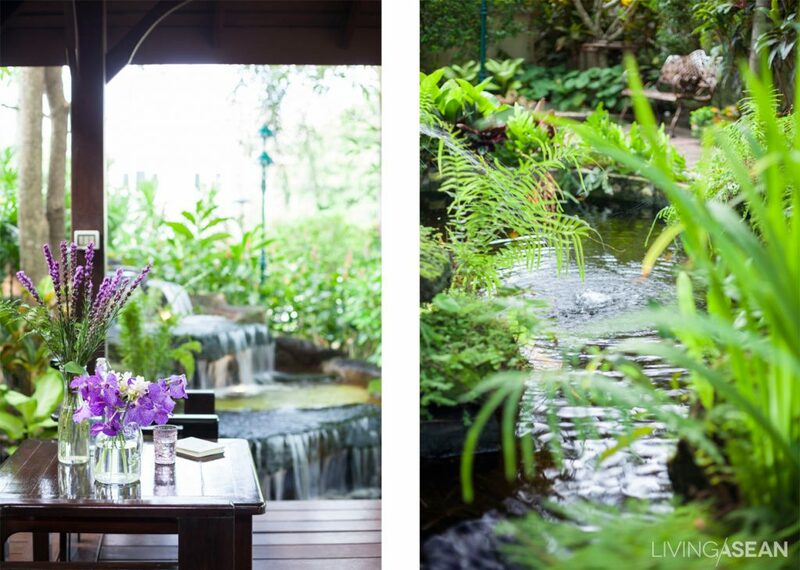 The heart of this little forest is a pavilion overlooking a really beautiful garden with a fishpond. Visitors can gaze in admiration at brightly colored carps swimming in it. One has to cross a small wood bridge to get there. 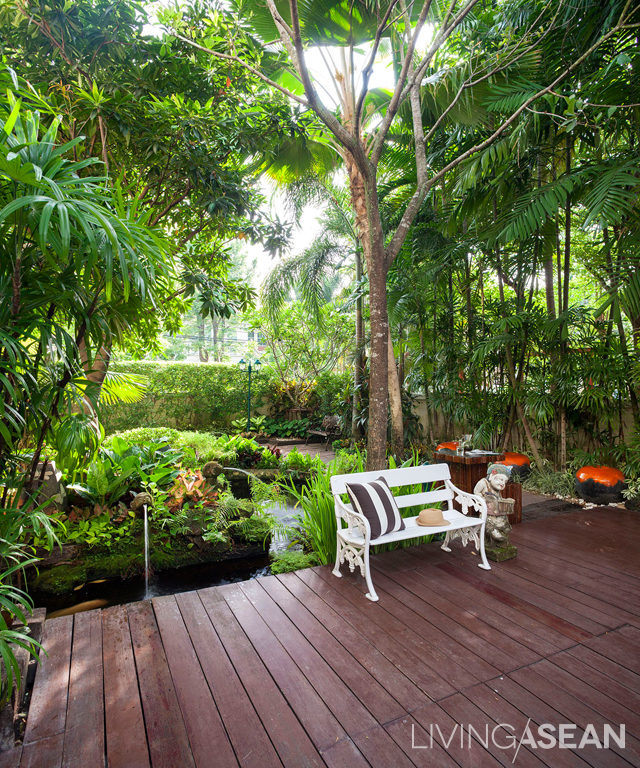 Mimicking real forests of the Tropics, it’s a health giving place and a perfect sight to see. The Tropical garden setting has charmed small animals. The owner said that birds and squirrels always visited here, giving him the opportunity to study their behaviors closely, which didn’t occur often in the urban area. A perfect retreat from city life, it’s where you can feel the breeze blowing in your hair and leaves rustling in the wind. The sounds of moving water make it feel like an escape to another world – one embraced by Mother Nature.